I'm sharing a Waco classic. . .
as in been around since 1915 classic. Vitek's BBQ began as a butcher's shop and that high standard of quality meat has remained after all of these years. While everything at Vitek's is wonderful, your first time visiting this iconic place, you must order a Gut Pack. 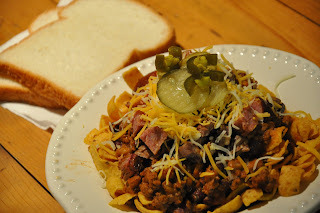 A Gut Pack is what I would consider a Texas version of the standard frito pie. They add chopped beef, beans, and sausage. Served with a side of onions, pickles, jalapenos and, of course, a sweet tea! Cover a plate with Fritos. Spoon chili over the fritos and add beef and sausage. Top generously with cheese. Add pickles, onions, and jalapenos to the top! Serve with 2 slices of white bread! Brown ground chuck with garlic in a pot over medium high heat. Add tomato sauce, Rotel, salt, oregano, cumin, and chili powder. cover and reduce heat to low. Simmer for 30 minutes. Add drained and rinsed beans. Stir to combine, then cover and simmer for another 20 minutes Mix masa with water, then add to the chili. Stir to combine and simmer for a final 10 to 15 minutes. Thanks for stopping by my blog and leaving a comment;) hope your following! love this recipe btw! yummy!